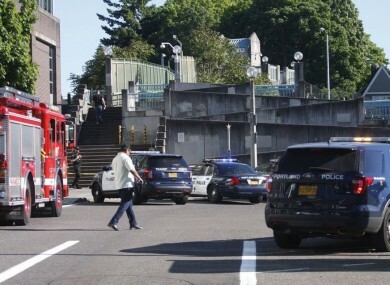 TWO PEOPLE DIED yesterday and another was hurt in a stabbing on a Portland light-rail train after a man yelled racial slurs at two young women who appeared to be Muslim, one of whom was wearing a hijab, police said. Officers arrested a man yesterday afternoon who ran from the train, The Oregonian reported. Police were still working last night to identify the man and the people who were attacked. Before the stabbing the assailant on the train was ranting on many topics, using “hate speech or biased language,” and then turned his focus on the women, police Sergeant Pete Simpson said. Evelin Hernandez, a 38-year-old resident of Clackamas, Oregon, told the newspaper she was on the train when the man began making racist remarks to the women. A group of men tried to quiet him and he stabbed them, she said. Millions of Muslims marked the start of Ramadan yesterday, a time of intense prayer, dawn-to-dusk fasting and nightly feasts. Email “Two people stabbed to death after trying to stop anti-Muslim rant, say US police”. Feedback on “Two people stabbed to death after trying to stop anti-Muslim rant, say US police”.